Verizon opens a new front in the home energy automation wars—and sets up potential competition for utility home networking tech favorite ZigBee. Verizon has become the first major U.S. telecom provider to launch a commercial-scale home automation line of business -- and it has picked the proprietary Z-Wave wireless mesh technology to enable it. That’s big news in the home energy management space on a number of levels. For starters, Verizon’s move to start selling home security and energy management services -- first to its nearly 5 million FiOS broadband internet customers in the U.S., but later to Verizon Wireless customers nationwide -- represents a potentially major expansion of the market for smart thermostats, lighting controls and smart plugs beyond the realm of wealthy DIY homeowners and utility pilot projects. Second, Verizon’s choice of Z-Wave, a proprietary low-power wireless mesh technology, could represent a major challenge to ZigBee, an alternative wireless mesh standard that’s been adopted by most of the utilities now deploying smart meters in North America. While ZigBee is in most of the smart meters out there today, Z-Wave has more home automation devices on the market, about 500 at present -- a factor that helped push Verizon toward using it, according to Michael Weissman, vice president of corporate marketing for Z-Wave chipmaker Sigma Designs. Weissman also told me that more big U.S. telecom players are poised to announce Z-Wave-enabled home platforms of their own in the coming months, though he didn’t share any names. Verizon’s launch isn’t exactly a surprise -- reports of its plans to add home automation to its suite of phone, TV and broadband offerings have been circulating for years. Nor is its choice of Z-Wave a shocker -- Verizon has been piloting Z-Wave-based home automation since January, and reports from this summer predicted today’s rollout in terms of the product lines that would be made available. Still, the news does put a big feather in the cap of backers of Z-Wave, including Motorola, which bought home automation vendor 4Home late last year. 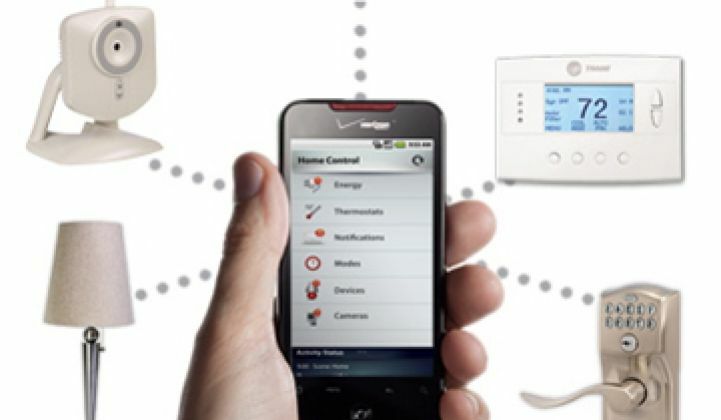 4Home designed the interface that Verizon will be making available to home automation customers. Sigma Designs also licensed Japan’s Mistumi as a second source of Z-Wave chips in May, a move Weissman intimated could be in preparation for Japanese telecom giant NTT DoCoMo to roll out a Z-Wave-based home sensor product line it’s been testing since last year. Verizon’s service itself will run through customers’ FiOS broadband connections to a Wi-Fi- and Z-Wave-enabled gateway device, which will then communicate to the various home automation devices -- cameras, door locks, on-off wall plug devices and lighting modules -- that Verizon will sell through its website, Weissman said. Customers will be able to access control interfaces via web portal and smartphone, he added. As for Verizon Wireless customers, they’ll need to have residential broadband access to log into the control interface, Weissman said. Though details on that future rollout aren’t yet set, he predicted a customer launch in 2012. One big question for Verizon is whether its customers are ready to spend on home automation. To be sure, Verizon’s base monthly subscription fee of $9.99 is pretty low compared to the $30 to $40 per month fees typical of many home security offerings, Weissman noted. But that fee also comes with an upfront cost for the gateway and Z-Wave-enabled devices that connect to it, ranging from $69.99 for an indoor camera and remote-control light switch for simple home monitoring, to $169.99 for the basic energy control kit, which includes a smart thermostat, a 110-volt appliance switch and a circuit panel energy reader. A combination of the two costs $219.99. That’s a lot of money to spend for the privilege of being able to remotely check home webcams and turn lights and appliances on and off. Weissman also noted that the basic service Verizon is rolling out doesn’t incorporate any utility electricity pricing information, making it difficult for users to perform more sophisticated analyses of just how much money they’re saving by resetting thermostats or turning off lights from their smartphones. 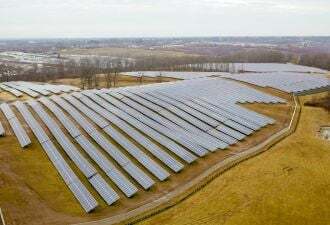 That would make Verizon’s initial offering a lot less energy-specific than the home energy management products coming from the likes of Tendril, EnergyHub, Control4 and the dozens of other firms crowding the space. Then again, Tendril and EnergyHub are waiting for utilities and partners to push their offerings to customers. Control4 has both utility partnerships and channels to market via retail and installer sales, but costs more than what Verizon is charging for its admittedly less robust set of features. Whether or not offerings like Verizon’s will push energy awareness and automation into the minds of homeowners -- and help Z-Wave capture home energy market share from ZigBee -- remains to be seen. Indeed, it’s likely that home security, rather than home energy monitoring, will be the driver for early buyers of Verizon’s service -- a factor that’s led startups like iControl to emphasize home security over energy controls in their go-to-market plans. Perhaps it will take a broader -- and cheaper -- home automation offering to get energy awareness into the market. The departure of Google and Microsoft from the home energy management space earlier this year made clear that current interest in constantly readjusting thermostats and turning off vampire loads isn’t exactly the most popular household pastime. With the average U.S. household spending only $100 a month on electricity, it’s hard for most homeowners to justify spending hundreds of dollars to shave a few percentage points off their bills. But it’s possible that a simple offering like Verizon’s might end up connecting to utilities someday. Weissman pointed out that Sigma Designs launched a bridge device that can connect smart meters to Z-Wave home control systems last month. While he couldn’t name any utilities interested in linking their smart meters to Z-Wave-enabled homes right now, perhaps they’ll be more interested if a few million homeowners have thermostats that are ready to be connected to the utility.